There is something very significant about those who have given everything in service to their country. Military service has been an honorable profession for as long as history has been keeping records. Brave soldiers from all walks of life have come together to give everything, if necessary, for their country’s way of life. The United States of America is no different. Though our country is relatively young, men and women have been sacrificing their lives for the protection and stability of our great nation for over 200 years. Millions have given much, and hundreds of thousands have given all. These soldiers, men and women alike, are honored in their military service in a variety of ways. Some have received badges and medals; others have received written commendations, while others have received U.S. flags. 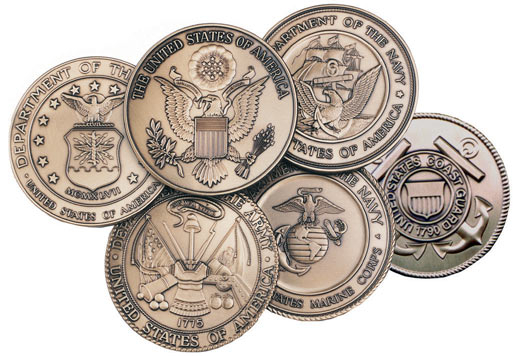 Many have been honored to receive a combination of these over the course of their military careers. The Military Flag and Medal Display Case is exactly the case you need to display whichever emblems you choose in honor of your veteran. The perfect size case for your mantle, this display case can hold an ample amount of memorabilia that you can arrange however you like. The shadow box design gives the flexibility to add or subtract medals, badges and certificates for display. The case is available in either Red Oak or stained Walnut, and comes with a red, blue, green or black background. The flag display portion of the case will hold a United States Flag sized for a coffin and given to relatives at funerals. This flag comes sized 5x9, and when folded, fits perfectly behind the display glass. If you or a loved one has received commendations for your service in the United States Military, regardless of the branch of service, it’s time to consider displaying these honors in a tasteful and elegant manner. Children and grandchildren of U.S. Veterans everywhere will look back on these honors with fond remembrances of their loved ones. Every service man and woman is a hero to us all. Displaying their medals, badges and flags is the perfect way to honor them, whether they are still living or if they have passed on. Remembering the way someone dies is often a very painful thing. Remembering how someone truly lived, on the other hand, is what each of us would much rather do. The Military Flag and Display Case is just the right piece to help us remember our veterans for the service they performed while they were with us. They gave all, now you can share their sacrifice with the world and honor them at the same time. Orders for the Flag and Medal Display Case, Shadow Box, Combination Flag/Medal are usually shipped out within one business day to places within the USA and Canada.